Source of inspiration for the new collection, traditionally was the prêt-a-porter collection by Dolce & Gabbana for Spring/Summer 2011, which itself is the embodiment of true femininity. 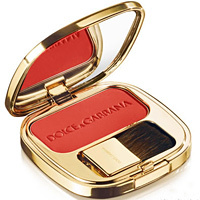 The creators of the cosmetics line Domenico Dolce and Stefano Gabbana, call it “a fresh interpretation of Sicilian culture, dedicated to young, contemporary woman, sophisticated and romantic at the same time. Therefore, the basis of “Italian Summer” is a palette of soft, neutral tones, combined with classic pink, gorgeous, sensual purple and red. They allow you to create both natural and modern makeup, and beautiful makeup for evening party, contributing to the image of a modern vamp woman.